This article is meant to provide you with details about the extendedReach Custom Form Builder, used in Activities and Reports. If you have a question not addressed here, you can search at the bottom of this article in Related Topics or you can Contact Support. 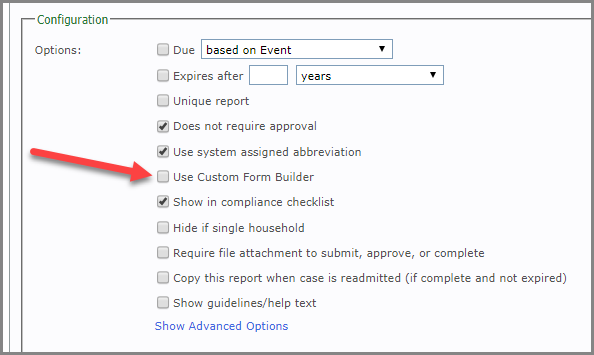 The Custom Form Builder is a tool used to create customized forms within activities and reports. This tool is an upgrade from basic Custom Fields. 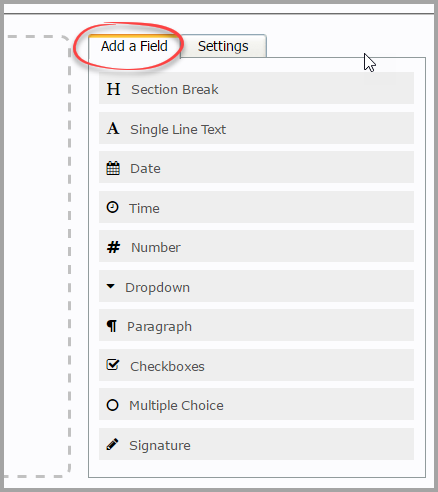 You can now create up to 200 fields, record narratives, and customize of the layout of forms. From an Activity Type or Report Type, click on Edit mode. Click on the General tab, and scroll down to Configuration. 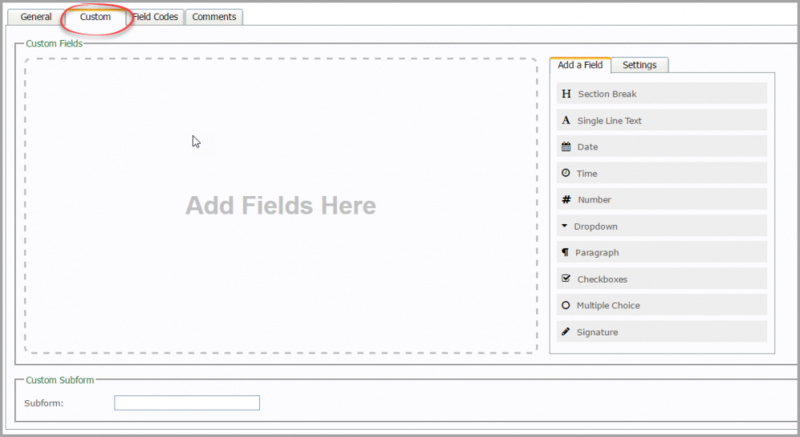 Place a check-mark in the box next to “Use Custom Form Builder”. Click on the Custom tab to begin configuring the custom form. This is a Drag & Drop Interface. Add available fields found on the right side of the screen, to the the form by dragging and dropping each field into the “Add Fields Here” space, or by simply clicking on the field. Section Break Visually organizes information to be gathered. Single Line Text This space will remain small for the visual cue that user should provide a short answer. Number Number field. Could be used to capture time in minutes. Dropdown User will be able to pick customizable values from a list. Paragraph Increase this space of field for the visual cue that user should expand on answers. Checkboxes User will be able to pick customizable values from a list. Multiple Choice User will be able to pick customizable values from a list. Signature If required, user can sign with a mouse or touch screen. To delete a field, simply hover over the field and click on the red X that appears in the lower right hand corner of the box. Click on a field, and then click on the Settings tab to customize that field. Label: Add labels to name each field. Required: Check this box if you require this field to be completed before the user can continue. See above Field Descriptions for more field customization details. This is an advanced option for extendedReach developers and can be ignored. Go to compliance checklist within a case or home, and click on the revised report/activity. Complete form and continue with your workflow process. For more details regarding Workflow, please see our Creating, Approving, and Completing Activities and Reports (Workflow) Article. Every time you create a new field in Custom Form Builder, a field code number is assigned to that field. For more details regarding adding Field Codes to documents and case notes, please see our article titled Field Codes.